A SAS programmer asked how to rearrange elements of a matrix. The rearrangement he wanted was rather complicated: certain blocks of data needed to move relative to other blocks, but the values within each block were to remain unchanged. It turned out that the mathematical operation he needed is called a block transpose. The BTRAN function in SAS/IML performs block-transpose operations, so the complicated rearrangement was easy to implement with a judicious call to the BTRAN function. This article discusses the block-transpose operation and gives an example. It also shows how a block transpose can conveniently transform wide data into long data and vice versa. In general, a block matrix can contain blocks of various sizes. However, the BTRAN function requires that all blocks be the same size. Specifically, suppose A is a block matrix where each block is an n x m matrix. That means that A is an (r n) x (c m) matrix for some whole numbers r and c. The BTRAN function transposes the blocks to create a (c n) x (r m) block matrix. The idea is more easily explained by a picture. The following image shows a matrix A that is composed of six blocks (of the same size). The block-transpose operation rearranges the blocks but leaves the elements within the blocks unchanged. 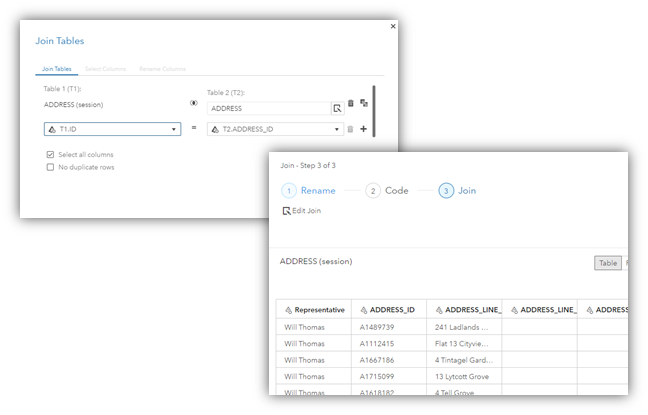 Let's see how the block transpose works on an example in the SAS/IML language. The following statements create a 4 x 12 matrix. 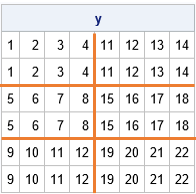 I have overlaid some grid lines to help you visualize this matrix as a 2 x 3 block matrix, where each block is 2 x 4. The output is a 6 x 6 matrix, visualized as a 3 x 2 block matrix. 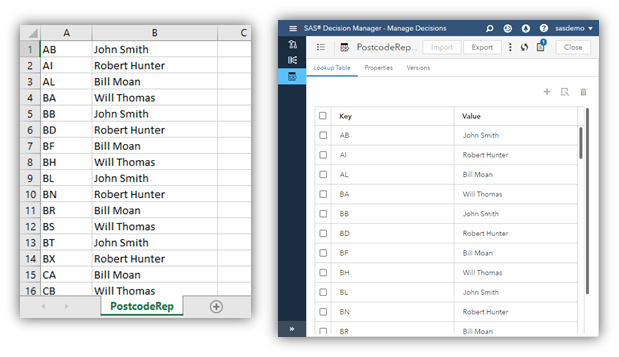 In a similar way, you can transpose balanced data from long form to wide form. (Recall that "balanced data" means that each group has the same number of observations.) For example, the Sashelp.Iris data contains a Species variable. The first 50 observations have the value 'Setosa', the next 50 have the value 'Versicolor', and the last 50 have the value 'Virginica'. You can use a WHERE clause or a BY statement to analyze each species separately, but suppose you want to create a new data set that contains only 50 observations and has variables named SepalLengthSetosa, SepalLengthVersicolor, SepalLengthVirginica, and so forth for the other variables. The BTRAN function makes this easy: just specify a block size of 50 x 4, as follows. In summary, the BTRAN function is a useful function when you need to rearrange blocks of data without changing the values in a block. For balanced designs, you can use the BTRAN function to convert data between wide and long formats. The post Transpose blocks to reshape data appeared first on The DO Loop. Having trouble with a DATA step program or an ODS statement? Specialists in the areas of SAS programming, SAS Studio, and graphics might be available during select afternoon hours. When these specialists are available, you can request their assistance as soon as you click the Technical Chat button. When prompted with What is the nature of your inquiry?, select Usage of Base SAS, SAS/Studio or graphics. For all other questions, select All other products and/or tasks. Generalists are available throughout the day to answer questions. Although every effort is made to resolve your question during the chat, sometimes the chat agent needs to open a track with a subject matter expert. Your question will still be addressed with the same urgency and professionalism that you are accustomed to when working with SAS Technical Support! When the chat is complete, you can request an emailed copy of the chat transcript. 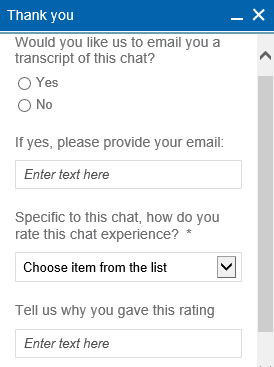 You can also rate your chat experience and provide feedback. Your responses are important to us as we continue to evaluate and improve our Technical Chat services. 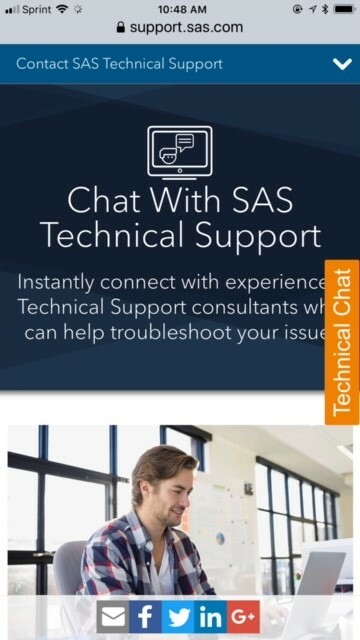 Try it out. . . . Chat with SAS Technical Support! Solve your SAS questions with Technical Chat was published on SAS Users. The post DNA and your family tree ... 6-10 generations back appeared first on SAS Learning Post. In a recent article about nonlinear least squares, I wrote, "you can often fit one model and use the ESTIMATE statement to estimate the parameters in a different parameterization." This article expands on that statement. It shows how to fit a model for one set of parameters and use the ESTIMATE statement to obtain estimates for a different set of parameters. You can use PROC NLMIXED to fit either set of parameters and use the ESTIMATE statement to obtain estimates for the other set. In general, you can do this whenever you can explicitly write down an analytical formula that expresses one set of parameters in terms of another set. /* The gamma model has two different parameterizations: a rate parameter and a scale parameter. ESTIMATE stmt to estimate the parameter in the model that was not fit. The parameter estimates are the same as from PROC UNIVARIATE. However, PROC NLMIXED also provides standard errors and confidence intervals for the parameters. More importantly, the ESTIMATE statement enables you to obtain an estimate of the rate parameter without needing to refit the model. The next section explains how the rate parameter is estimated. You might wonder how the ESTIMATE statement computes the estimate for the rate parameter from the estimate of the scale parameter. The PROC NLMIXED documentation states that the procedure "computes approximate standard errors for the estimates by using the delta method (Billingsley 1986)." I have not studied the "delta method," but it seems to a way to approximate a nonlinear transformation by using the first two terms of its Taylor series, otherwise known as a linearization. 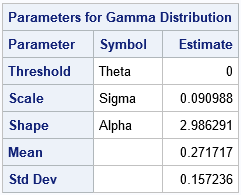 In the ESTIMATE statement, you supply a transformation, which is c = 1 / β for the gamma distribution. The derivative of that transformation is -1 / β2. The estimate for β is 0.09. Plugging that estimate into the transformations give 1/0.09 as the point estimate for c and 1/0.092 as a linear multiplier for the size of the standard error. Geometrically, the linearized transformation scales the standard error for the scale parameter into the standard error for the rate parameter. 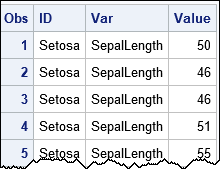 The following SAS/IML statements read in the parameter estimates for β. It then uses the transformation to produce a point estimate for the rate parameter, c, and uses the linearization of the transformation to estimate standard errors and confidence intervals for c.
The estimates and other statistics are identical to those produced by the ESTIMATE statement in PROC NLMIXED. For a general discussion of changing variables in probability and statistics, see these Penn State course notes. 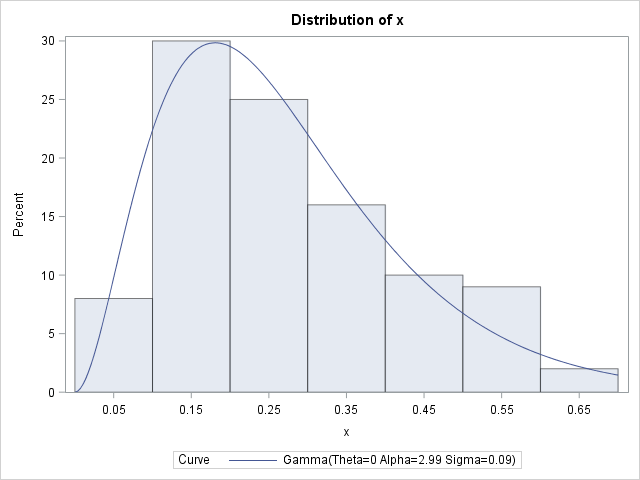 For a discussion about two different parameterizations of the lognormal distribution, see the blog post "Geometry, sensitivity, and parameters of the lognormal distribution." In case you are wondering, you obtain exactly the same parameter estimates and standard errors if you fit the rate parameter directly. That is, the following call to PROC NLMIXED produces the same parameter estimates for c.
For this example, fitting the scale parameter is neither more nor less difficult than fitting the rate parameter. If I were faced with a distribution that has two different parameterizations, one simple and one more complicated, I would try to fit the simple parameters to data and use this technique to estimate the more complicated parameters. The post Parameter estimates for different parameterizations appeared first on The DO Loop. The post Amazon's data train just keeps a rollin' appeared first on The Data Roundtable. Old and new SAS users alike learned the tricks of the data trade from our Little SAS Book! We hope these fun tips from our exercise and project book teach you even more about how to master the data analytics game! 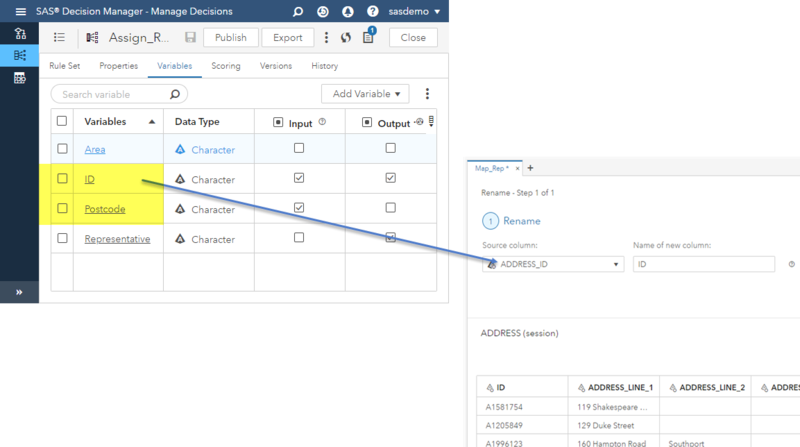 My favorite tip to share with students and SAS users is how to use PROC FORMAT to group quantitative variables into categories. 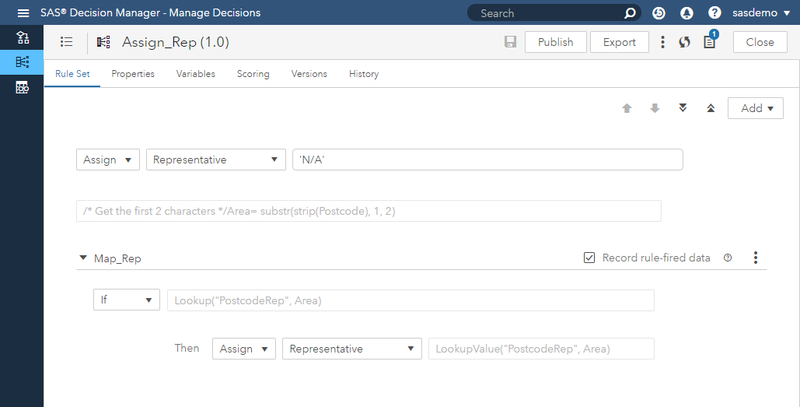 A format can be created with a VALUE statement that specifies the ranges relevant to the category groupings. Then, this format can be applied with a FORMAT statement during an analysis to group the variable accordingly (don't forget the CLASS statement when applicable). You can also create categorical variables in the DATA step by applying the format in an assignment statement with a PUT function. This tip I learned from fellow SAS Press author Alan Wilson at SAS Global Forum 2008 in San Antonio. It might be a bit overly dramatic to say that this tip changed my life, but that’s not far from the truth! So, I am paying this tip forward. Thank you, Alan! To comment out a whole block of code, simply highlight the lines of code, hold down the control key, and press the forward slash ( /). SAS will take those lines of code and turn them into comments by adding a /* to the beginning of each line and an */ at the end of each line. To convert the commented lines back to code, highlight the lines again, hold down the control and shift keys, and press the forward slash ( /). This works in both the SAS Windowing environment (Display Manager) and SAS Enterprise Guide. 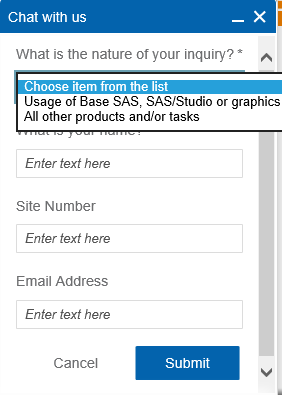 If you are using SAS Studio as your programming interface, you comment the same way, but to uncomment, just hold down the control key and then press the forward slash. 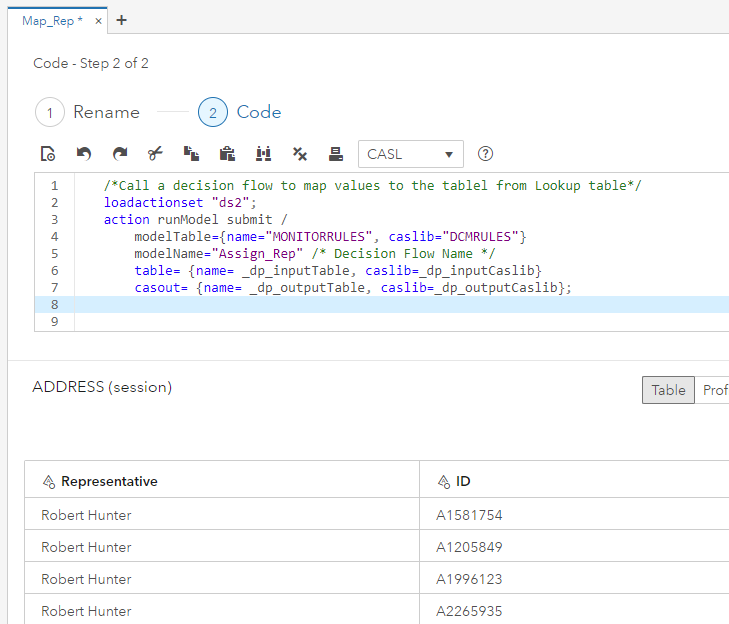 There is no question that writing and debugging SAS macros can be a challenge. So I have two "macro mottos" that I use to help keep me on track. 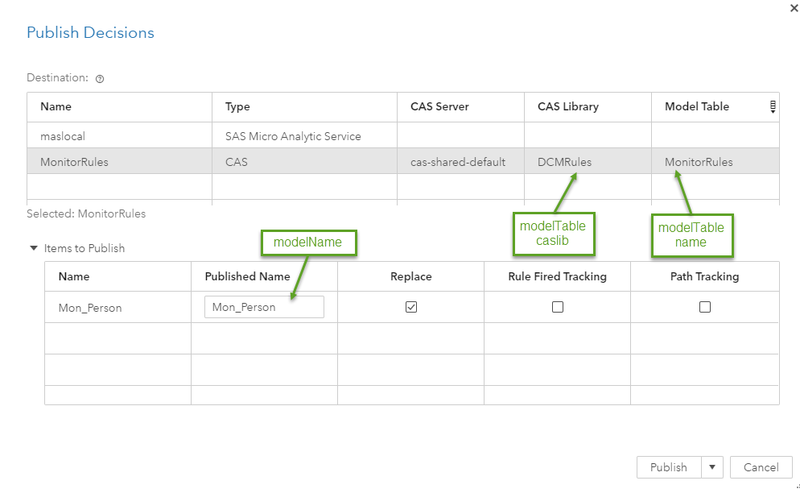 This is the most important concept to keep in mind whenever you work with SAS macros. If you feel the least bit confused by a macro, repeating this motto can help you to see what is going on. I speak from personal experience here. This is my macro mantra. This means, write your program in standard SAS code first. When that is working and bug-free, then add your %MACRO and %MEND statements. When they are working, then add your parameters, if any, one at a time. If you make sure that each macro feature you add is working before you add another one, then debugging will be vastly simplified. And, this is the best time ever to learn SAS! When I first encountered SAS, there were only two ways that I could get help. I could either ask another graduate student who might or might not know the answer, or I could go to the computer center and borrow the SAS manual. (There was only one.) Today it's totally different. Two of the most popular self-paced e-learning classes are available for free: SAS Programming 1: Essentials, and Statistics 1. These are real classes which in the past people paid hundreds of dollars to take. You can access hundreds of SAS training videos, tutorials, and demos at support.sas.com/training. Topics range from basic (What is SAS?) to advanced (SAS 9.4 Metadata Clustering). If you encounter a problem, it is likely that someone else faced a similar situation and figured out how to solve it. On communities.sas.com you can post questions and get answers from SAS users and developers. On the site, www.lexjansen.com, you can find virtually every paper ever presented at a SAS users group conference. 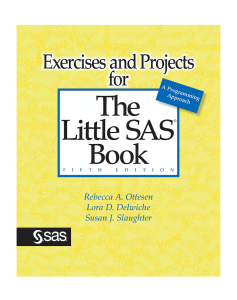 If you want even more tips and tricks, check out our Exercises and Projects for The Little SAS Book, Fifth Edition! Let us know if enjoyed these tips in the comment boxes below. New to SAS? Ready to learn more? 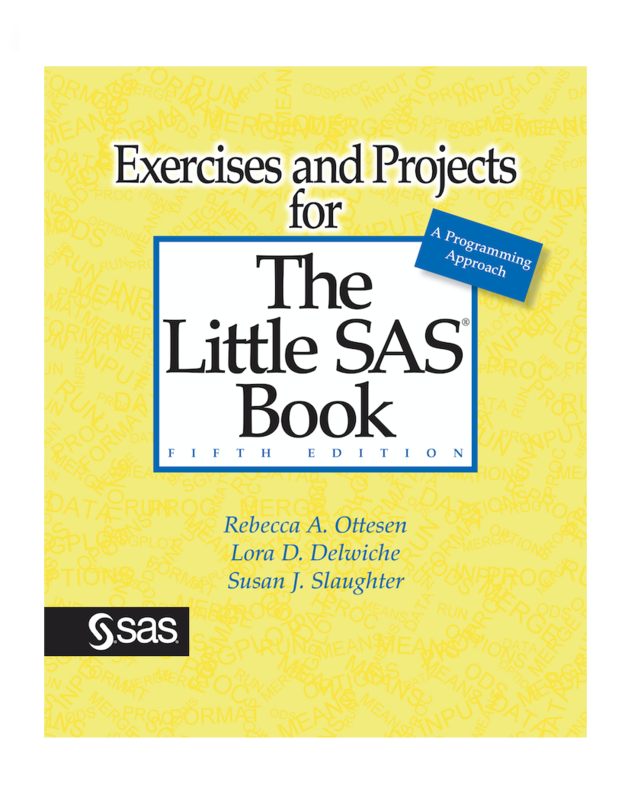 Check out these tips and tricks from the authors of Exercises and Projects for The Little SAS Book, 5th Edition was published on SAS Users.